Patrick Ewing. Walt Fraizer. Willis Reed. These players are some of the best New York Knicks of all time. Do you know who’s not even close on the list? Point guard Raymond Felton. But, you’d think by the way Knicks fans were chanting his name last night that he’s without question a Knicks legend. On Monday at Madison Square Garden with the Knicks down 18 points to Felton’s OKC Thunder, fans started a ‘Ray-mond Fel-ton’ chant. 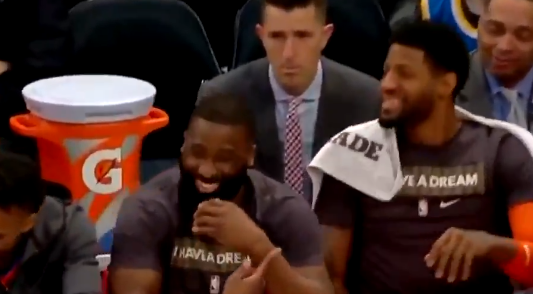 Felton laughed on the Thunder bench while Paul George joined in. The 34-year-old played two seasons in New York, starting at point guard during the Knicks last playoff appearance in 2012-13. He was perfectly adequate during his tenure. It’s been a rebuilding season in the Big Apple, with the Knicks only winning 10 of their first 45 games. During the loss against the Thunder, fans just wanted to have some fun. Personally, I love the move. Felton won’t be remembered as a franchise great, but for a few brief moments, he can pretend like he was. Kudos to the Felton for being a great sport.